The president says the project must have a specific timeline and proper funding. 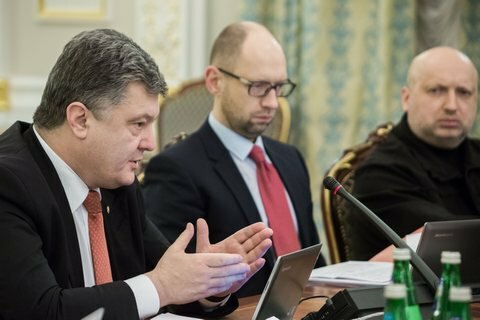 President Petro Poroshenko has said at a meeting of the National Security and Defence Council that Ukraine should set up a production of rockets and ammunition, the presidential press service has said. "These should be not only slogans or calls but [the project with] a specific timeline and proper financing, and manufacturing orders for the most deficit types of ammunition," the president said. He instructed state customers and the state concern Ukroboronprom to ensure the development and purchase of missile munitions within the framework of the Olkha project, winged missile systems based on technical solutions of the Neptun project of new artillery systems, high-accuracy rockets and ammunition, anti-tank missile systems and other. Special attention should be paid to drones, up-to-date APCs, communication and reconnaissance means, navigation equipment and space intelligence means. It is planned to develop and buy modernized aircraft, helicopters, medium-range anti-aircraft missile systems, radars and jammers. Weapons will be bought for the Navy ad the purchase of combat vessels and armoured artillery boats will be considered.